About 10 classical albums – 1 POP/EDM album and 6 EDM singles. I am focusing on Pop/EDM vocals in the future. Well I decided to get into vocals. So first I wrote a strong music track that could stand on its own, without a vocal, but constructed it carefully for a vocal to go on top. If you listen to the instrumental track it actually has a slight “swing” beat to it. Then I contacted Mickey because I love her voice… the rest is history. I love music and I love to dance. It’s a no-brainer for me. I think it is a great opportunity for artists to flourish as never before. With the rise of the internet an artist can now establish his own career without the necessity of a major label. On my current release Mickey Shiloh, Ralphi Rosario, Victor Dinaire, Bissen, Mr. Mig, Gino Caporale, Stan Medley, and DJ cMellow. Previously, The Lords of Easton, DJ cMx and I am working on my next release with…well I can’t say yet…it’s a surprise. I believe dance music should be listenable not just danceable. Well maybe The Stones, Skrillex, Sean Paul, Michael Jackson, Led Zeppelin … anyone who really knows how to rock and pop the house. I don’t remember but it was probably some old heavy rock album. I am really a rocker at heart and greatly influenced by rock music….but I love to dance. Honestly, I haven’t had time to listen to anything for a few months…so probably “I Got a Problem (I Wonder)” as its the only song I have been listening to for months on end, and surprisingly I haven’t gotten tired of hearing it… which even surprises me. Sports, Dance, business, reading, study. Sorry, it’s under wraps at the moment. But it will be another great vocal/dance song. More great songs with great singers. Thank you. You guys do a great job helping new artists get their music exposed. Keep up the good work. Living life is an art. I really like to call myself a creator rather than an artist as people typically use the word “artist” in a very narrow sense – like you are a painter, or musician, etc. In actuality, the guy who creates a monster successful business is an “artist” and the man who is a loving father and teaches his kids to love and respect as he does, is an “artist”. Anyone who is a master “creator” in any direction in life is an “artist”. We just don’t always acknowledge them as such. How important is live music to you and will you be touring with the new release? Very important. The cool part about live dance music is to dance, and to enjoy dancing, and to just let go and have fun. It isn’t about how good of a dancer you are, or how cool you look while dancing, it’s that dancing is an emotional and physical release that we can all enjoy. A good live performer will get his audience to lose their inhibitions and just dance and have fun. That is what I always try to do with my audience. And yes, I will be touring and doing spot shows, but right now I am also creating a lot of new music and tracks so I am in the production mode in the immediate future. My next show will be at “Scarefest” a private party/show on Halloween. You have a rather unique grungy EDM sound, very rhythmical yet very melodic. 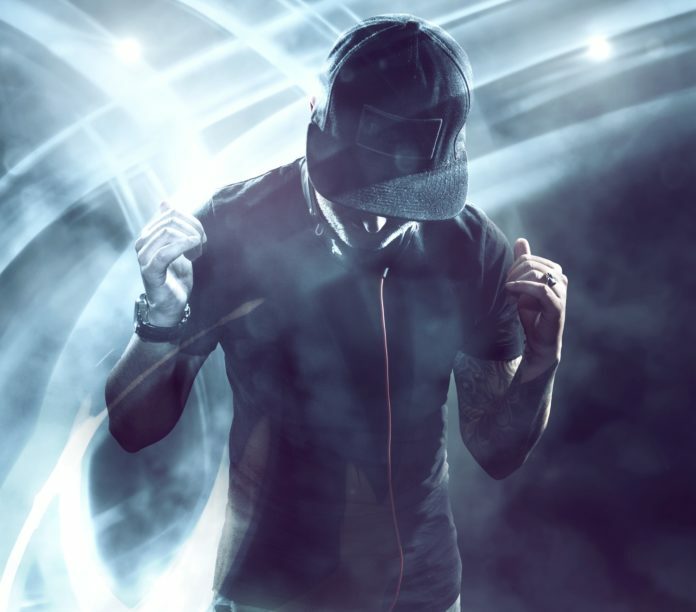 A lot of people in the EDM space – and I mean a lot – have this copy cat mindless dance music, that you can dance to but that is about all it’s good for. Your songs have a quality about them that is also appealing at those moments we don’t want to dance but just want to listen. Well that’s a good question. My genre is me, it’s new. Let’s call it Genre H. I like hard rock, jazz, classical and I like to dance. I like the mindless Techno/Hose stuff when I am dancing, but I also wanted to bring something to the table that one can listen to while one is not on the dance floor. The great rock performance bands in the 60 and 70s use to have these “instrumental” “interludes” that would go on for 5, 10 or even 15 minutes – like “In A Gadda Da Vida” by Iron Butterfly – comes to mind or “Light My Fire” by the Doors or “A Whole Lotta Love” by Led Zeppelin – heavy rock instrumental interludes…They used all kinds of different instruments … keyboards, drums, guitars to rock out to. Whether chill or hard, the interludes were not mindless, they were both rhythmic and melodic You could certainly dance to it, but you could also enjoy “listening” to it. That is sort of my influence, but I have kind of EDM’d it….and taken away the vocals….until now. Now I notice besides EDM you do a lot of classical remixes and work. Are you classically trained? No not at all, but I think Classical music is a good training ground for any musician. Again, I point to the history or rock and from the late 60s to the 80s rock music got progressively more and more “classical” and “instrumental. Evolving from the “instrumental interludes” of the 60s as mentioned previously. That evolved into a sort of classical rock with songs like “Roundabout” by Yes into bands like Queen, Kansas, Styx. Most of that fell apart by the mid-eighties but you can still see its influence today in bands like MUSE who have a little bit of classical flavor. So, to make a long winded answer even longer, I think that classical music is a great training ground for whatever you want to do. EDM, Pop, Rap, Hip Hop, Rock, Jazz, or Country. Well if you are not classically trained have you had any music training? How were you able to tackle classical music without training? Well I have had training – just not classical training. I have had both singing and music notation and composition training. But most of all, music is about listening. You don’t have to be “School” trained as much as trained in basics and trained how to listen. You don’t have to be trained how to read and write music (music notation) in order to write good music, but no matter how good you are, you will be better if you learn to read and write music. It is definitely an advantage. So, in your opinion, has EDM introduced “mindlessness”? No not at all, and perhaps EDM can lead to another renaissance of instrumental music as we had in the 70s and 80s. Mindlessness is introduced by music execs who, fearful for their jobs, only want to do what worked before. This is what creates the “copy-cat” mode although the greatest artists have always been different than those before them and have introduced a “new” sound. “Mindlessness” was also introduced by MTV in the mid-80s when suddenly the “visual” was more important than the “music” – historically musical sophistication went down from there – at least “classically” and instrumentally speaking. Although bands like Queen survived and MUSE is the modern-day holdover of “classical” influence. Is there anything else you’d like to let people know about you, your music, or your plans for the future? Well, if you are a fellow musician, hit me up on my website and let’s see if we can make some cool music together. If you are a fan or an audience, hit my up for a party or an event, and I guarantee I will get everyone dancing.